HDClarity collects crebrospinal fluid (CSF): the liquid that surrounds the brain and spinal cord, to measure the progression of HD by measuring the biomarkers that reflect the changes inside the brain cells. 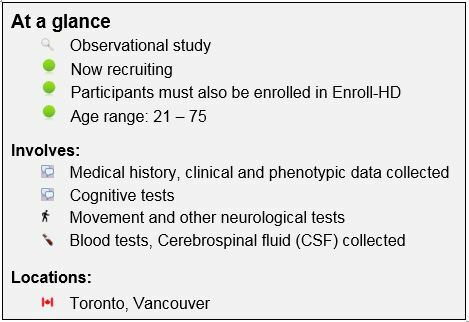 This is a new international study aiming to collect samples of CSF from several types of volunteers: gene-positive people without any symptoms of HD, gene-positive people who have symptoms and people who are either gene-negative or have no family history of HD. Participants will attend a screening and sampling visit. During the screening visit, medical history, and clinical and phenotypic data will be obtained. Participants who meet the eligibility requirements and are willing to continue in the study, will return for a sampling visit during which CSF and blood will be collected following an overnight fast: blood will be obtained via venipuncture and CSF will be obtained via lumbar puncture using local anaesthetic if required. Approximately 120 participants will be invited to attend an optional repeat sampling visit 4-6 weeks after the original sampling visit. HDClarity will seek to enroll approximately 600 research participants – 500 of whom will be at different stages of Huntington’s disease (HD) and 100 healthy controls. The primary objective is to collect a high quality CSF sample for evaluation of biomarkers and pathways that will enable the development of novel treatments for HD. The secondary objective is to generate a high quality plasma sample collection matching the CSF collections, which will also be used to evaluate biomarkers and pathways of relevance to HD research and development. Exclusion during history or physical examination, final decision to be made by the Site Principal Investigator; including but not limited to: any reason to suspect abnormal bleeding tendency, e.g. easy bruising, petechial rash; or any reason to suspect new focal neurological lesion, e.g. new headache, optic disc swelling, asymmetric focal long tract signs; or any other reason that, in the clinical judgment of the operator or the Site Principal Investigator, it is felt that lumbar puncture is unsafe without brain imaging. For more detailed information on this study and others and for the most recent updates, please go to clinicaltrials.gov. ClinicalTrials.gov is a registry and results database of publicly and privately supported clinical studies of human participants conducted around the world.